Acclaimed novelist and journalist Colm Tóibín, newly appointed as Professor of Creative Writing at The University of Manchester’s Centre for New Writing, hosts the first in a series of high-profile public events. The conversations will cover topics of current literary and cultural interest. 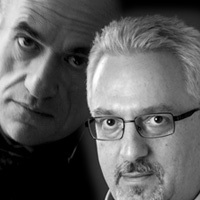 In this first event Colm Tóibín welcomes English novelist, and winner of the 2004 Booker Prize Alan Hollinghurst. Alan Hollinghurst was born in 1954. He is the author of one of the most highly praised first novels to appear in the 1980s, The Swimming-Pool Library, and was selected as one of the Best of Young British Novelists 1993. His second novel, The Folding Star, won the James Tait Black Memorial Prize and was shortlisted for the 1994 Booker Prize. His most recent novel The Line of Beauty won the 2004 Man Booker Prize for Fiction. It was adapted for BBC Television by critically acclaimed screenwriter Andrew Davies in 2006. His new novel The Stranger's Child will be published in July 2011. This event is part of the Manchester Literature Festival 2011.